The paper deals with the definition of karst collapse intensity. The technique for determining the intensity of karst formation and collapse on the basis of calculation and probabilistic method is given. In reality, karst col-lapse formation is affected by a great variety of natural and anthropogenic factors. Each factor can vary quite widely. Certain combinations of factors can cause karst process activation, while other combinations are not able to bring the natural system out of balance. The paper describes a technique for determining karst collapse intensity from incomplete data. It uses karst processes monitoring data in the area and monitoring data of areas with similar values of the most significant factors leading to the karst collapses. Keywords: karst collapse intensity, karst, karst collapse. Makeev Z.A. The principles of engineering geological zoning of karst regions // Moscow Conference on Karst, vol. 4. – Molotov: Publication Molotov State University, 1948. Maksimovic G.A. Karst basics. Volume 1. – Perm: Perm Book Publishing House, 1963. Tolmachev V.V. Engineering and building development of karst territories / V.V. Tolmachev, G.M. Troitsky, V.P. Homenko; Ed. E.A. Sorochana. – Moscow: Stroyizdat, 1986. – 176 p.
Tolmachev V.V. On the method of quantitative assessment of environmental factors affecting the formation of karst failures. Processing of MIIT, 1968, vol. 273. Sharapov R.V. 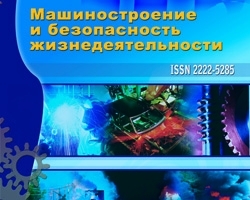 Monitoring exogenous processes // Engineering industry and life safety, 2012, № 2. – P.39-42. Sharapov R.V. Some of the application of new information technologies in the simulation of emergency situations // Engineering industry and life safety, 2008, № 5. – P.62-66. Sharapov R.V. Some problems of exogenous processes monitoring // Fundamental research, 2013, № 1-2. – P. 444-447. Sharapov R.V. Review of approaches to modeling emergency situations // Engineering industry and life safety, 2012, № 1. – P.39-41. Sharapov R.V. Indicators for monitoring and assessment of karst processes // Engineering industry and life safety, 2013, № 1. – P.28-34. Sharapov R.V.Reflections on ecological and geological systems // Bulletin of the Tambov University. Series: Natural and Technical Sciences, 2013, Vol 18, № 3. – P. 918-922. Scheffe H. The analysis of variance – Moscow: Science, 1980. – 512 p.
Determination of karst collapse intensity from incomplete data, №2 (16) 2013, Sharapov R.V.